Names in the Bible have important meanings. For instance, my daughter Sara’s name from the Bible means princess. My son Jason’s name means one who will heal. However an angel didn’t tell me what to name my children. Even in Bible days, I am sure it was very rare to have an angel appear to the parents to tell them what to name their baby. His name is Wonderful. “Therefore God also has highly exalted Him and given Him a name that is above every name, that at the name of Jesus every knee should bow.” Phil 2:9. His name is Counselor. Jesus Himself said, “I am the good Shepherd and I know my sheep. My sheep hear My voice.” John 10:11, 27. His name is Mighty God. The Hebrew here is God Almighty, showing that the One who fulfills this prophecy will be God Himself, the One True God. He is the Everlasting Father. Again this is an indication of Jesus’ divinity. He told Philip, “He who has seen Me has seen the Father,” John 14:9. 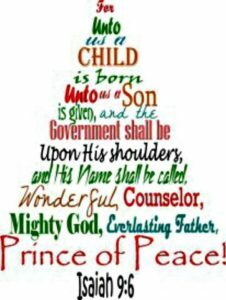 He is the Prince of Peace. 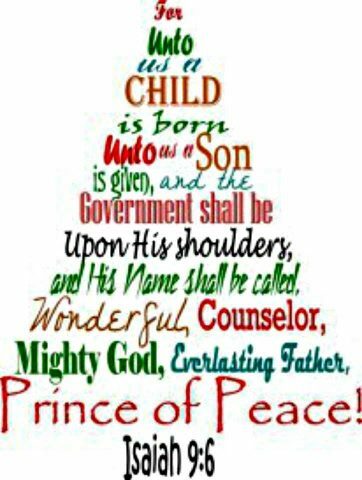 Peace was proclaimed by the angels to the shepherds in the field, “Glory to God in the highest, and on earth peace, goodwill toward men!” Luke 2:14. Peter in Acts 4:12, said, “Nor is there salvation in any other, for there is no other name under heaven given among men by which we must be saved. The name given by God in heaven, announced by the angels. When the filthiest sinner calls on that Name of Jesus in faith, God will wash the sinner white as snow.